The regular 2017 legislative session ends on Sunday, and although we have operating budget proposals from the House Democrats and Senate Republicans, negotiations have stalled. Despite multiple attempts by Democratic budget negotiators to initiate talks, Republicans are refusing to come to the table. While this is very frustrating, talks on education funding are progressing and I am hopeful the rest of the operating budget will begin making progress as well. In this legislative update, I will share with you how different the priorities are that are laid out in the two state budgets. 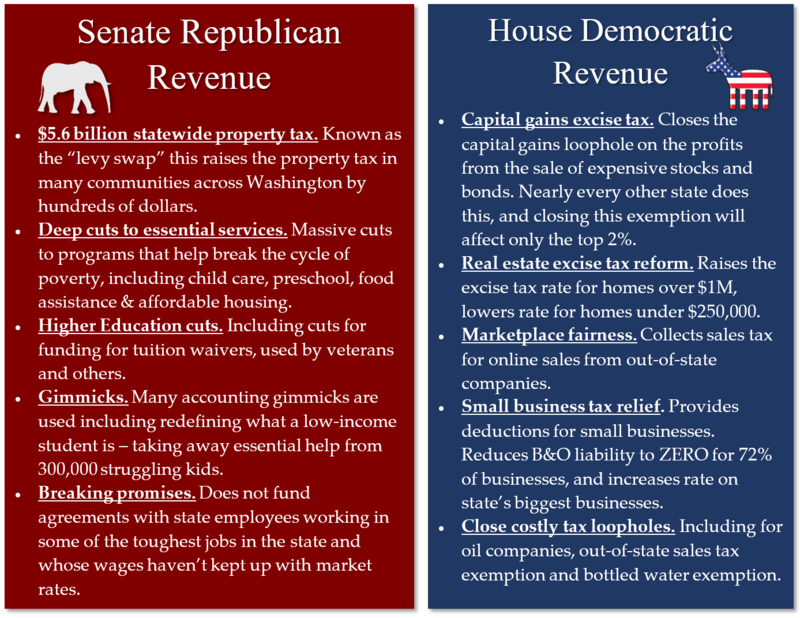 On the one hand, Democrats propose revenue from progressive sources that begin to right our upside-down tax system, while on the other hand Republicans make deep cuts to the social safety net and rely on a $5.6 billion statewide property tax hike to fund education that includes a levy swap proposal that would provide significant tax cuts for some major corporations and force major tax hikes in Seattle while providing less to our students. As always, I will continue to fight for working families, progressive tax reform and social justice for our community and state. Please contact me with any comments, concerns or questions. There are three separate budgets that fund all the responsibilities of the state. They are passed on a biennial basis, or every two years, with smaller supplemental budgets passed in alternating years. The operating budget is the main budget for the state, with proposals this year ranging from $43 – $46 billion. 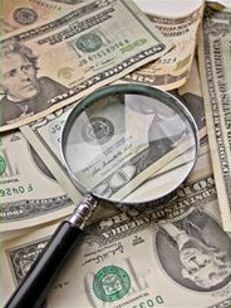 It funds everything from higher education to state agencies to the mental health care system. I offered an amendment to the budget to appropriate funds to begin the process of studying the possibility of a state-owned bank. While the amendment received a majority vote, it still failed because of a 60-percent rule the majority Republicans invoked for amendments to the budget and so narrowly failed. On the bright side, support for this idea increases each year – in great part due to those of you who have been speaking up. I still haven’t given up hope for us to make progress on a state bank this session as I continue this fight. To learn more about my state bank proposal, click here. You can read the state bank amendment by clicking here, or watch my floor speech by clicking here. To watch my floor speech on the operating budget vote, please click here. The transportation budget funds everything from pedestrian safety, traffic improvement projects, bridge repairs, ferries and avalanche control. Negotiations are ongoing with the House of Representatives to pass a transportation budget, and how to deal with major outstanding issues like HOV/Hot Lanes/tolls, and MVET taxes. The capital budget funds a variety of building and maintenance projects throughout the state. From affordable housing grants to schools to community and arts centers and parks, the capital budget is critical to building and expanding public spaces throughout Washington state. I teamed up with our budget negotiators and the other members of the Senate Members of Color Caucus to advocate for key projects and investments in our districts. Key priorities include the Housing Trust Fund, Building Communities Fund Grants, Dental Capacity Grants, and hazardous/toxic material cleanup money. 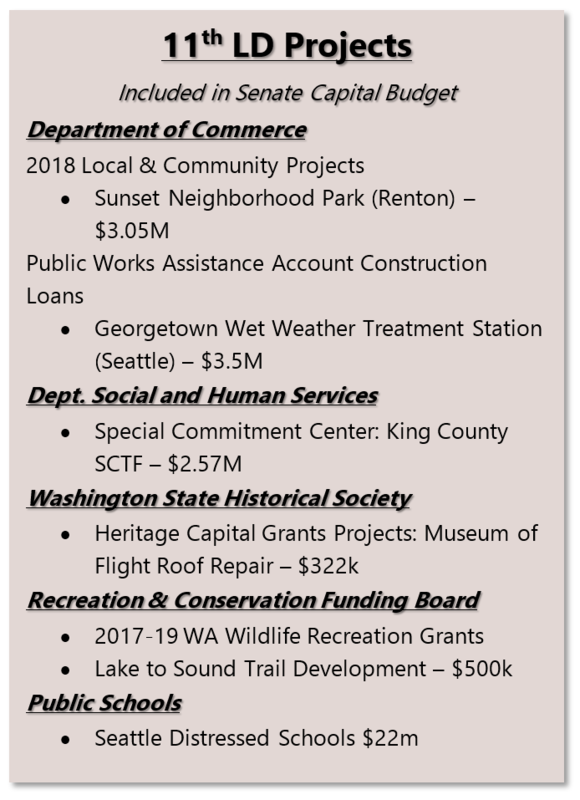 Specific projects include Sunset Neighborhood Park, Museum of Flight, the Multicultural Community Center, Renton Technical College and many more. I will continue to advocate for these and other 11th District projects as the final capital budget is negotiated with the House of Representatives. I also offered an environmental and job-creating amendment to the capital budget (the only Democratic amendment accepted by the Republican majority) that studies the feasibility of electrifying our railroads, a project known as Solutionary Rail. Finally, I’ve been fighting for racial justice issues, speaking on the Senate floor to various issues that are otherwise swept under the carpet. These issues include legal financial obligations reform, police use of deadly force, racial impact statements for any proposed legislation, and emergency notifications in languages other than English where appropriate. This is only a taste of the breadth of issues we’re dealing with this legislative session. As you can see there are no shortage of fronts to be fought for our community. Please know that I am here in Olympia fighting for you. Budgets are really a statement of values – what is funded and what is cut shows what each party thinks is a priority and what they don’t. 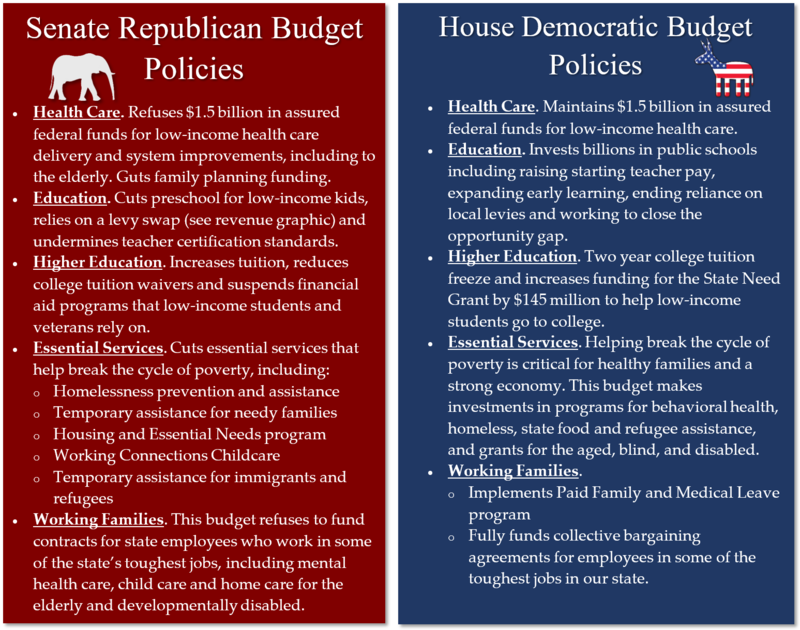 As you can see from the comparisons below, there are stark differences in priorities between Democrats and Republicans in this year’s budget proposals. 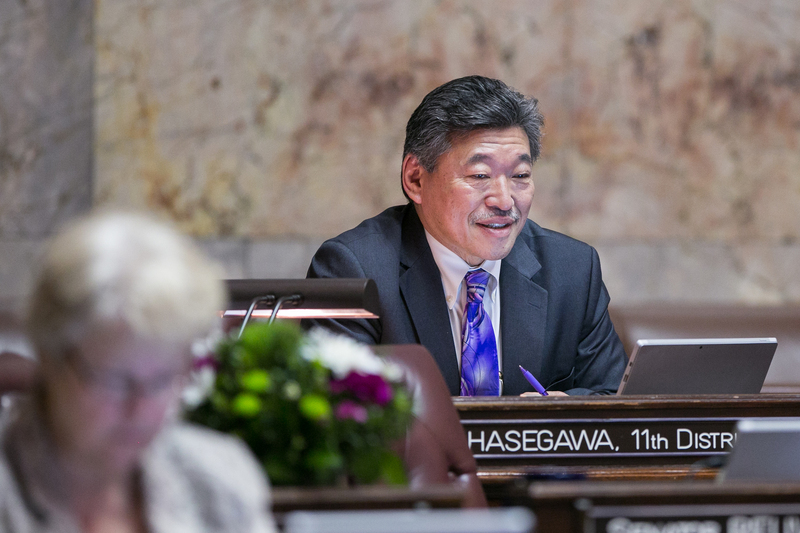 OLYMPIA – Sen. Bob Hasegawa speaks regarding his no vote of the Senate Republican operating budget, which makes deep cuts to the social safety net and doubles down on Washington’s upside-down tax structure. 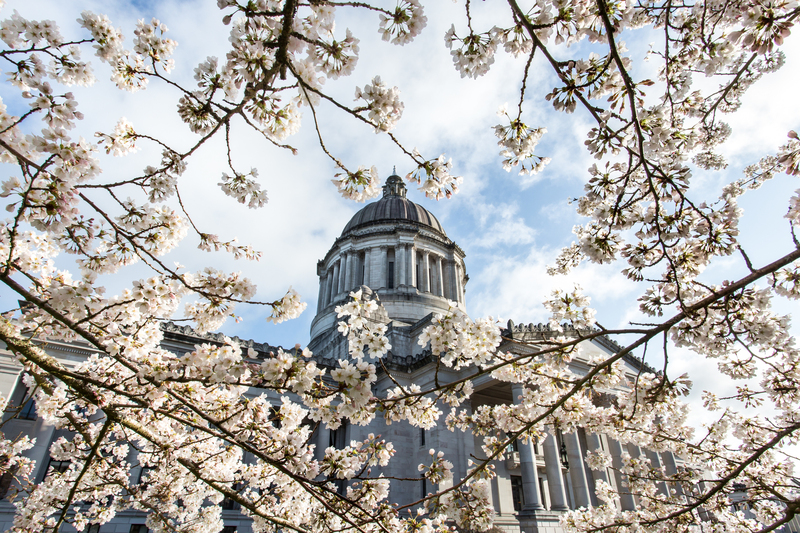 OLYMPIA – Sen. Bob Hasegawa offers an amendment to study the possibility of a publicly owned bank, or state bank, and the benefits this could bring to the state of Washington. To learn more about Hasegawa’s efforts regarding the state bank please click here or you can watch a short video about it here. OLYMPIA – Hasegawa speaks against a measure to sweep funds from the Public Works Trust Fund, used for grants to local governments for essential infrastructure including clean water and sewers. 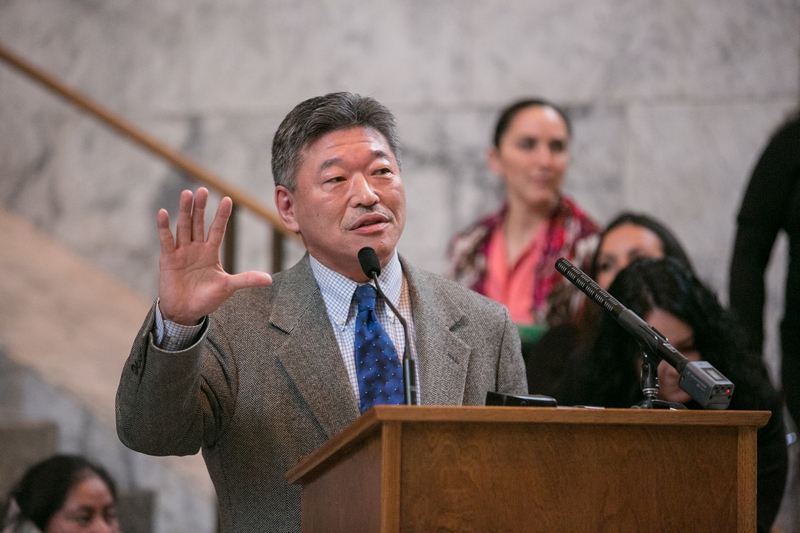 OLYMPIA – Sen. Bob Hasegawa makes a speech in support of progressive funding for education funding that gives relief to families in the 11th district and throughout Washington. OLYMPIA – Sen. Bob Hasegawa, D-Seattle, offered an amendment to the Senate budget that would have provided funding and/or guidance to agencies for racial and ethnic impact statements on certain proposed legislation, including in areas of criminal justice and education policy. The state already provides fiscal impact statements to proposed legislation upon legislators’ request, allowing lawmakers to know what monetary impacts there would be to the state budget or to agencies’ budgets should a bill pass into law. Racial and ethnic groups are often disproportionately impacted by changes to law, and Hasegawa’s amendment would have provided insight into the impacts on racial and ethnic groups in Washington prior to changes in policy. The amendment was voted down on party lines, with all 13 Senate Republicans voting against it. To hear more about the amendment, please click here or you can watch a video of Hasegawa speaking to his amendment below.